Con Ed seemed to be cruising toward its goal of building the plant when Scenic Hudson, an environmental group formed in 1963 to stop the project, began reckoning with the full ecological impact of the hydroelectric plant. Writer Robert Boyle had discovered that the Hudson River was alive with marine life. Boyle equated the prospect of licensing a plant in the Storm King area with the thought of slaughtering sheep in his own living room. The idea was slowly dawning on environmentalists that the hydroelectric plant would doom the river’s population of striped bass. Lifset argues that the introduction of ecological issues transformed the environmental movement in the Hudson Valley and helped lay the groundwork for its ultimate success. This increased focus on ecology alone would never have led to the demise of Con Ed’s plans were it not for an equally important turn in the law that Lifset also explores in his book. 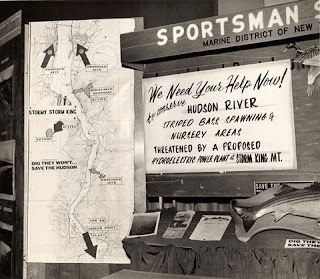 In 1965 a federal appeals court ruled that Scenic Hudson was an aggrieved party and had the legal standing to launch a challenge to the Federal Power Commission with respect to Storm King. The decision reprimanded the power commission for failing to create an adequate evidentiary record, thereby foretokening the later implementation of environmental impact statements.